For businesses in the commercial marine sector, LED luminaries can provide a competitive edge over companies that rely on outdated lighting systems. The unpredictable conditions of marine-based operations, mostly from corrosive saltwater and rough handling, can degrade mainstream luminaries quickly. For businesses in the commercial marine sector, LED luminaries can provide a competitive edge over companies that rely on outdated lighting systems. The unpredictable conditions of marine-based operations, mostly from corrosive saltwater and rough handling, can degrade mainstream luminaries quickly. Without protection, businesses are forced to maintain or replace the lights often, which can be costly from a long-term perspective. When it comes to lighting technologies in the marine industry, LEDs are slowly replacing outdated metal halide and incandescent options currently being used by boaters, docks, ship yards and oil and gas facilities. According to a July 2015 report published by the US Department of Energy, installation of LEDs has increased exponentially between 2012 and 2014, resulting in up to 215 million units and three percent LED penetration. Read on to understand how LED technology is being applied in the marine sector. 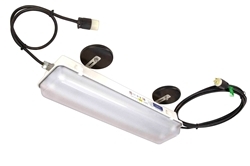 The advantages of installing boat LED lights are numerous. Whether they are mounted on a boat for tracking at night or used underwater for field research, LEDs boast a general lifespan of over 50,000+ hours. For boaters, this equates to roughly 4.5 years of continuous output! By decreasing the need for lamp replacements and maintenance, businesses could reduce costs significantly. Moreover, the robust lights also reduce energy consumption by up to 70 percent. By comparison, traditional lighting technologies, such as incandescent bulbs, waste up to 80 percent of energy on heat. Durability is another aspect that LEDs dominate considerably. The technology leverages a solid-state design that improves its ability to withstand rough treatment. Other fixtures are filled with loose filaments and toxic chemicals, such as mercury. Exposing such outdated lights to extreme, outdoor conditions could result in premature failure and breakage. Solid-state designs are known for their heavy duty capabilities. During illumination, LEDs rely on movement of electrons inside a semiconductor-type material. This also allows boat LED lights to operate between -40C and +85C, as well as in environments with humidity levels below 65 percent. Because most lights used for boating come in frequent contact with water, it is important that they do not release dangerous, toxic substances during failure or breakage. A solution to this concern are LED boat lights. The luminaries are fully recyclable at the end of their lifecycle, thus helping operators reduce carbon footprints by up to 33 percent. •	Tug boats: Two mast head lights (vertically aligned) with a yellow luminary on top of the stern light. Movement (pushing, towing or inland) may also dictate the configuration of boat LED lights on commercial tug boats. •	Fishing vessels: During operation (while fishing), the boat must emit a red or green beam with full visibility above its main white light. Green signifies ongoing trawling operations, while red symbolizes other types of fishing operations. •	Pilot boats: When assisting or ferrying other boats, the vessels are required to emit a fully visible white light over a red light. LED technology is applicable to an extensive range of boat LED lights. For example, explosion proof, corrosion resistant LED tube-style fixtures with IP67 waterproof ratings may be used in ship yards, docking facilities that handle flammable substances and boat repair/paint shops. Low profile LED flood lights are applicable to outdoor docking stations for nighttime illumination. They may also be used to provide general outdoor lighting for commercial boat shops, restaurants and recreational areas near the water. For temporary or remote boating projects on dry land, LED light towers may be deployed as a complete lighting solution after sunset. On boats, LED light bars and spotlights (with waterproof and corrosion resistant protection) are useful during navigation. Due to their compact features, LEDs can easily be incorporated with hand lamps, flashlights and different mounting options. For early warning systems in marine environments, wireless LED strobe lights may be utilized. Lastly, LEDs can even take on different colors, color temperatures and output settings, depending on the needs of the vessel. This is incredibly useful for anglers who rely on green light to attract fish at night.